The one and only Roger Federer won his 72nd career title in the final of the Dubai Duty Free Championships, defeating Andy Murray 7-5 6-4 en route to his 5th Dubai title. He was also the champion in 2003, 2004, 2005, and 2007. With his 2nd title win of the season so far, the Swiss Maestro has had his best start to a season since 2007. He had not won two titles in the first two months of the season since then. The final between Federer and Murray was eagerly anticipated and the crowd was hot. The tension was there as well, as neither player gave the other any openings in the first few games of the match. Keep in mind also that Federer and Murray had not met on court in over a year so there was definitely a feeling out process. At 3-2 in the first, Murray held two break points on Federer's serve with the chance to take a stranglehold of the set. However, he was unable to capitalize, and a few games later Roger earned the crucial break at 5-5. He went onto hold to take the set 7-5. In the second set, Federer got an early break to go up 3-1. It would not last long though as a few poor decisions cost him a break - the first time his serve had been broken all week - and they were even again at 3-3. The momentum was seemingly all with Murray and Fed would have to fight hard to take the second set. Thankfully for him, he did. At 4-4 he got the decisive break when Murray played a tight game and Roger took advantage. He closed out the match in dramatic fashion, finishing with five straight inside out forehands (four at deuce, one on match point) to achieve victory in Dubai for the fifth time in the twenty year history of the event. Tactically, Roger played a great match, which we all knew he would need to do. He was striking the ball beautifully from the ground as he had been doing throughout the week, and he never let Murray dictate the play like the Scot was able to do against Djokovic the day before. Murray was a tad too predictable in his strategy whereas Federer was at his varietal best, mixing spin, angle, slice, and pace in a magnificent harmony of the strings quartet. Murray tried to attack the Federer backhand way too much, and Roger had it read most times. He basically set up camp in the ad side and dared Andy to try to attack his forehand. The Scot didn't do so, and Roger kept pouncing like a panther on short mid court balls that Murray was trying desperately to angle to Fed's backhand. This was the exact same problem that Andy had in the Australian Open final in 2010, which is interesting, because I figured the match would play pretty similarly in terms of the tactics utilized by both men. Overall, it was a superb week for Roger and he fully deserved to win the title. He did not drop a set and was only broken once, to Murray in the final. He now holds a 9-match winning streak, and has won five of the past seven tournaments he has entered, dating back to his US Open defeat to Djokovic last year. He has won 35 of his past 37 matches and 40 of his past 43 if you count since the start of the US Open. I don't care who you are, that is an incredible record to have over a six month period and Federer looks in imperious form as he heads into the all-important spring that leads up to the French Open and Wimbledon. I am very excited about what the future holds for the Maestro. Will he win a Masters 1000 title leading up to the French Open? Will he surpass Rafael Nadal for the #2 ranking? Can he go even further than that and regain his #1 ranking that will make him the leader for number of weeks at the #1 position? Much of what the next few months may do to the rankings depends on Djokovic and Nadal and whether or not they can defend their many points until Wimbledon, but if Roger can win a Masters 1000 title and then claim the French Open or Wimbledon, then you never know. Stranger things have happened. Who would have thought that Nadal would lose his #1 ranking to Federer in 2009 after the Spaniard's Australian Open triumph? Nothing is ever safe in tennis, and you never know what might happen. All I know is that whatever does happen, Federer's recent run of imperious form makes the next few months very intriguing for the top 3. May the Maestro continue to play his best! Enjoy the win Federer fans. It is certainly a very happy time right now, but let's hope it doesn't end here! 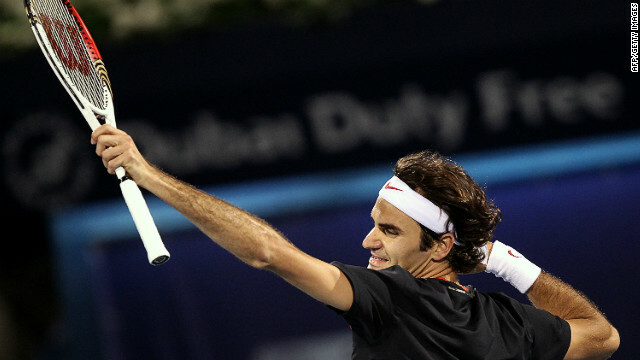 Fed has much more to accomplish in 2012, and I wish him all the best for the rest of the season! May he so gloriously win many more titles on his continuing path of greatness! PS II: The Dubai crowds were incredible all week long and their energy and excitement made watching the matches a very special experience! The crowds were particularly fantastic in Fed's final two matches. I can see why the players loving playing in the Dubai Duty Free Championships - it is a wonderfully organized event with supreme player accommodations and an excellent atmosphere. I hope the tournament may flourish for the next twenty years and the next twenty after that.